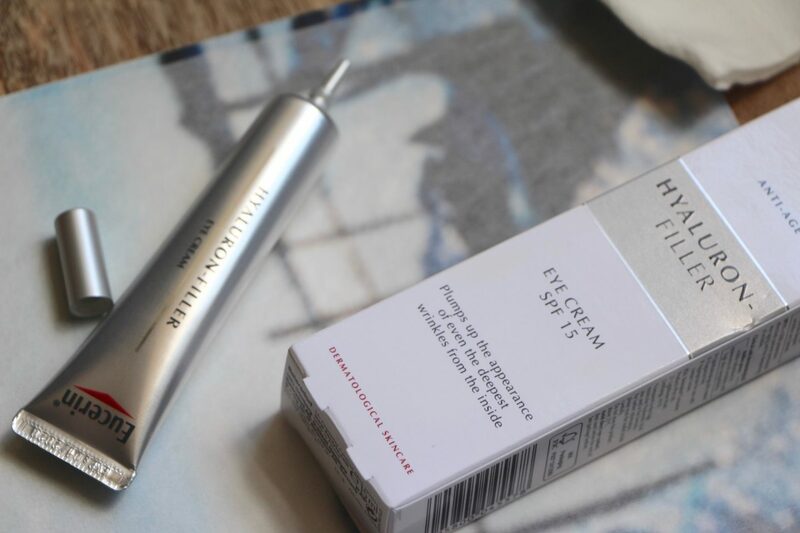 This Eucerin Eye Cream has been mentioned many times over the past couple of years, but it’s never had its own review page. And seeing as though it can be relatively difficult to find good eye products with added sunscreen, I thought that it would be handy to have a proper review in one, easy-reference location. 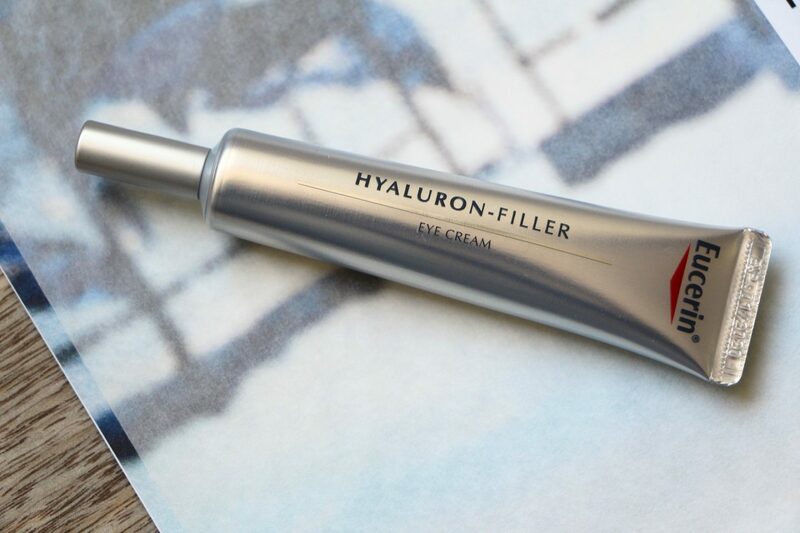 So here it is, the Eucerin Hyaluron Filler Eye Cream SPF15. A rich and robust-feeling cream that really hydrates but doesn’t leave the skin too oily for makeup application. Considering that the undereyes are a Designated Area of Potential Catastrophe when it comes to makeup application (concealer sitting in creases, mascaras smudging, wrinkles accentuated by over-enthusiastic loading-on of highlighter) you really do want an eye cream that sits well as a sturdy, non-slip base. And some eye creams just don’t – they’re better for nighttime usage or for people who don’t wear makeup. 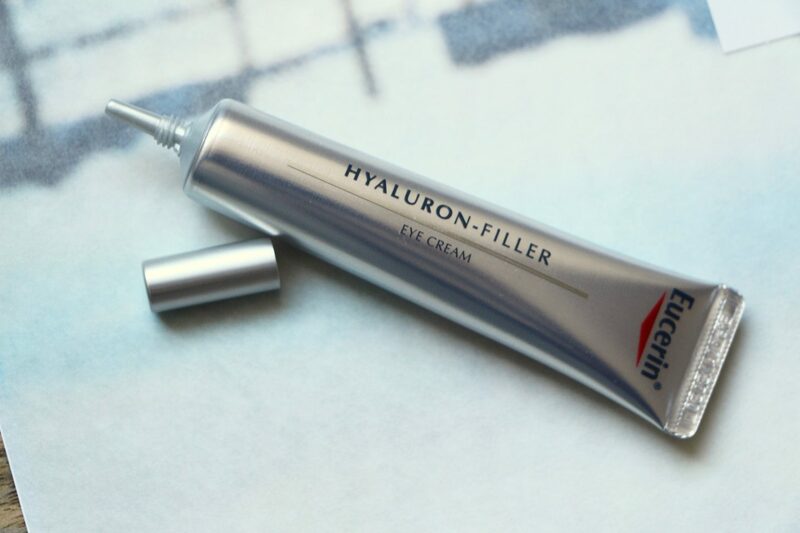 Eucerin’s Hyaluron Filler keeps the skin hydrated via our good old friend hyaluronic acid, but it also uses an ingredient called Glycine Saponin which has been shown to be very effective at stimulating the skin’s own hyaluronic acid production. So there’s the instant hydration fix, which makes everything look that bit fresher and firmer, but also a sort of “behind the scenes” activity going on – boosting the skin’s own hydrating capabilities. If you find that lots of sunscreen products make your eyes water then this is an excellent option and it doesn’t cost the earth. Sensible tube packaging, fragrance free, it’s a hard-working choice for daytime that won’t mess with your makeup. Find it at Escentual.com here* and Boots.com here* – it’s currently £14.66 instead of £22 at Escentual. Sounds like a good one especially as I need to take care of my eye area more! I am from India. Can I order this product from India? Sounds good, i’ve been on the hunt for a eye cream with spf. Oh no it isn’t – checked the website on this article and the discount on Escentual site is incorrect. Finding an eye cream with SPF is really hard. The only one I have found so far is by Aldi, the Lacura brand, and it isn´t always available. Never knew this existed but now I really want it! My undereyes have become drier so this sounds like a perfect affordable option. This sounds really great, I have sensitive skin, so anything that won’t smart when I go near my eye area would be ideal – shall have to give this a try!